A more detailed explication of these concepts can be found by drilling down through this roadmap. The spreadsheet is editable here if you want to extend or refine it. I’m open to any and all interpretations and ideas in these areas, would love to hear your thoughts. Don’t like the term static as the right end point. In systems theory the only thing that’s static is DEAD. The term that comes to mind as closer to what appears to be static is “Dynamic Nonchange”. My skin, for example, looks static yet changes constantly as all the molecules in my body slowly replace themselves. Pretty useful as it is. I hadn’t grasped that emergence comes so “early”. I had it much further left. please say more. what do you mean by “early”? I highly recommend this essay for an overall synthesis of complex systems organization. I read it before (thanks for the recommendation). I agree with him wholeheartedly and believe his model and visualizations are consistent with my own (at least the model in my head :-). I’m trying to visualize the entire space at once. But the paper reminded me that I had a similar categorization of regimes and types of systems, which I updated the post with above (see the spreadsheet). Our model is quite different. We us the term attribution instead of emergent. My questions seem to be about what it is that qualifies as an emergence. We define experience as any change to a given aggregate that becomes an attribute of that aggregate. However since we define function as ” a zero volume container”- “a point or Fulcrum”, so then do we encapsulate the other popular uses of Function in other terms, like consequence, attribute, mechanism, purpose, practice, behavior, implementation, and many others some of which have been themselves defined. What you appear to have created is a mixed mode model combining both structural objects along with procedural objects. This is a temporal structure overall. According to our model there are specific kinds or “types” of behaviors and all of them iterative by nature. We know from catalysis that frequency means everything. While we found no need to redefine a well defined word like catalysis, we did need to define a metabolism that is concerned with aggregating frequencies. With your permission I will print out this model and hang it my mediation section. In turn I will try to use Corel Draw to present some of our models attributes graphically. Nonetheless, good work on the above. That kind of stuff is hard to do. 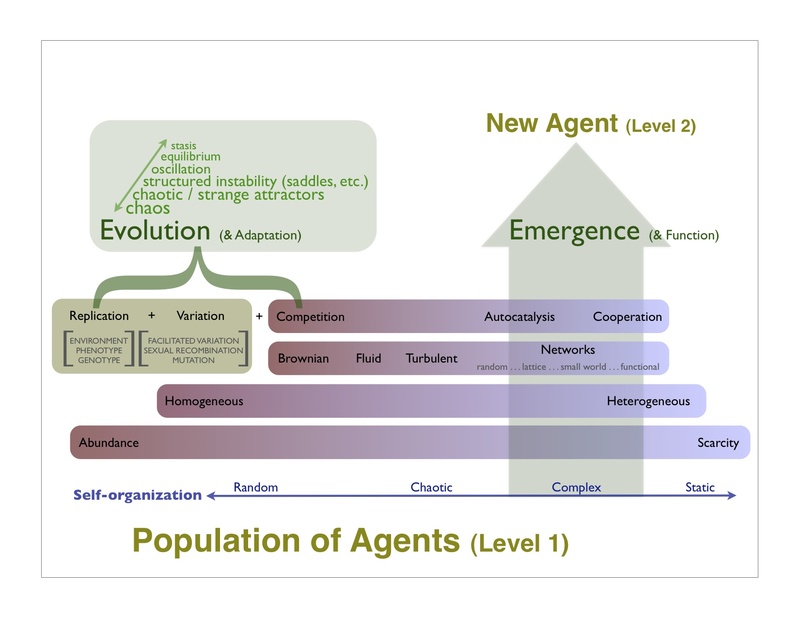 Nice diagram on Emergent Levels. You may be interested in some of the Philosophy diagrams on this blog: http://theelectronicjournal.blogspot.com/ Similar themes, different approach… would be good to know what you think!